The Westpac Northland Business Excellence Awards for 2015 took place at the Forum North last night. There were entrants from 43 Northland businesses competing in 5 business categories, 7 ancillary categories and an overall supreme winner. 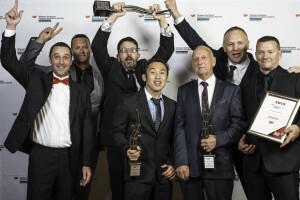 Donovan Group NZ Ltd was the Supreme 2015 Westpac Northland Business of the Year and was also the winner of the EROAD Excellence in Business Large Business Award and the Northland Inc Innovation Award. Donovan Group is a long standing Northland business which impressed the judges with their strong leadership and foresight, committed to take itself and the industry to the next level. Innovative products and processes have been achieved through strategic supplier partnerships, securing key personnel and intellectual property requirements. Efficient workshop manufacture and supply are aided by its national Coresteel franchise system and their bespoke IT planning and management system. Tony Collins from the NZ Chambers of Commerce Northland said that the awards were a fantastic opportunity to celebrate the success of many Northland businesses. These enterprises were of varying size and often very different in structure and scale. The one thing they all had in common was their passion for what they were doing and their commitment to succeed. • Hone Heke Lodge was voted More FM Customer’s Choice Service Provider while Cuppacakes Northland was the More FM Customer’s Choice Retail Provider. The Northern Advocate Business Hall of Fame inductee this year was Jeroen Jongejans in recognition of his contribution to Northland business.